"All skiers on the Silver Skis program will use the simultaneous start. Skier Number-One will line up at the extreme left of the line looking down the slope. �Number-Two shall be immediately on his right and so on. �On the starting line competitors shall line up at least one yard apart." Wow - excellent report Lowell! Glad things worked out so well. What a great day... thanks for putting this together Lowell! I turned on my GPS on at the top (and I know a few others did too). I'm not one to usually fiddle with waypoints and stuff, but it was interesting to see my progress down the snowfield afterwards in TOPO! A very humble 20 minute run for me - I think I finished 13th or 14th. However, I did win the snowboard division. In fact, I am told that I clocked the best ever snowboard time for Silver Skis. I averaged 22.4 MPH for the first five minutes. I averaged 11.6 MPH for the last five minutes. I averaged 4.3 MPH from Pebble Creek to the descent off of Pan Point. And I calculated that Matt must have averaged over 29 MPH over the whole descent! "If you post it, they will come." It was super to put yet more faces to names. What a powerhouse group of tourers too! Funny, I probably cranked out over a hundred turns between Muir and Pebble Creek. Maybe that has something to do with my 37 minute finish time. Then again, my quads were cooked from the trip up and wanted no part of a sustained tuck Also, Amar should have a couple minutes shaved off his finish time since I insisted he stop and snap a couple pics of Tim and I Thanks Amar, you've got the guiding spirit in your blood. Super good crazy fun all round! Thanks for putting yesterdays trip together Lowell! What a kick! I was originally a bit skeptical about the weather but it came together absolutely perfectly. The snowfield was butter smooth and the thin coverage around pan point kept speeds in check on the blind rollovers. The questionable forecast probably helped keep total number of Paradise visitors down too which helped crowd control on the lower sections. It blew my mind witnessing the Hummel brothers, Matt and Carl pull away down the upper snowfield - figure 11s the whole way! Can you say Cajones? For me too it was great to meet a bunch of new folks who I've heard so much about. I think everyone who participated should be praised for keeping it together and skiing within their abilities. As Lowell said everyone finished with a smile. All in all a wonderful and adventurous day! I had a great time too, quite a unique experience. Thanks Lowell and everyone else who participated. I was just happy to make it up to Muir at all, let alone get there nearly an hour faster than I hoped. I wouldn't have made it a couple of days earlier. Seeing you guys fly uphill provided me much-needed incentive and inspiration to keep chugging along, including trying to keep Lowell in my sights as he finally pulled away above 9500 ft after a nice chat in-motion. It was amazing to be part of the mass start, especially seeing several speeding bullets rapidly pulling away down the upper snowfield. I knew I wasn't going to make it nonstop the whole way down, so after a few seconds of straight-lining it was better to ease up and carve some nice big GS turns in the fine snow. I also took some photos, including sights I had never seen before on the Muir Snowfield: 3 parallel schusses, sometimes only 5-10 ft apart, extending all the way from Muir to near Pebble Creek. I'm assuming this was Matt and the Hummels, or maybe Carl. This two-shot panorama taken near 8200 ft shows the schuss tracks (center and right) extending upward out of sight nearly 2000 vertical feet, with Doug (JibberD) standing over on the left. Available in several sizes: quarter-size 730, half-size 1460, and even full-size 2920 pixels wide, in case any of the schussboomers want to try to identify (or claim) your tracks. Here's a picture of the group back a Paradise, including Tim, our 19th member, who took pictures. Good job pulling this off, Lowell, and sorry I couldn't make it yesterday. Sounds like you hit the weather window perfectly. Your second photo has a strangely 1930's look to it, as well - maybe a PhotoShopped sepia version would be fun. I too had to make turns. I started in a tuck but once I was going over 40mph, I started to worry about terrain irregularites and their implications at high speed. I have my stategy all planned out for next year. 13 minutes just doesn't cut it for me! That aside, it was a spectacular day with great company! Your second photo has a strangely 1930's look to it, as well - maybe a PhotoShopped sepia version would be fun. Okay, here's where I make a fool of myself. � �Please correct me folks. I'd like to get the names right for my journal. L-R: Sam Avaiusini, Jeromy Waddell, Kam Leang, Tim Petrick, Carl Skoog, Doug O'Donnell, Bill Frans, Jan Kordel, Peter Krystad, Kurt (dad) Hummel, Josh Hummel, Lowell Skoog (front), Adam Clark, Phil Fortier, Matt Kuharic (back), Dave Zulinke (back), Amar Andalkar, Dave Zike, Jason Hummel. "The 1934 race was really crazy, but several years later with starts 1 minute apart it was better. Also by 1936 when I raced the equipment was far better. Later Hannes Schroll, the Austrian downhiller, made a super fast run and beat the rest of us by one full minute. I don't remember which year that was; others made it in 5 minutes or 6 minutes. It all ended when Sig Hall killed himself in a fog hitting McClure rocks at high speed -- that finished the Silver Skis with a tragedy." 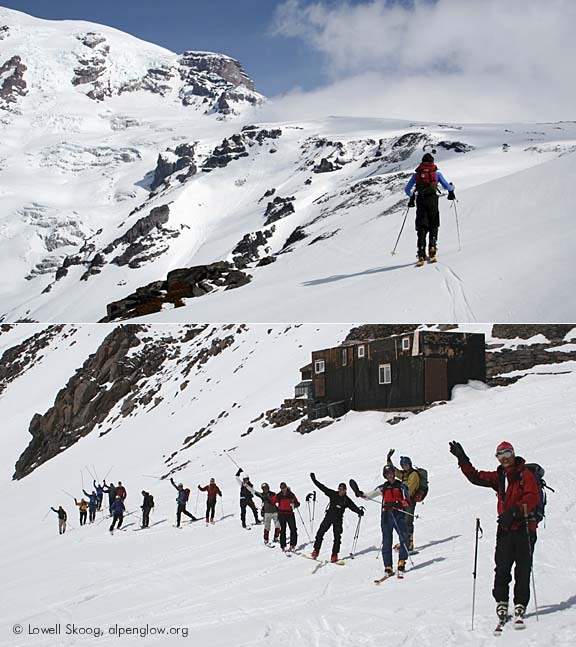 I wanted to try and explain the thrill I had racing down from Camp Muir. Here goes! Carl is above me, where will we land? 'Are you okay?' I hound. He is, amen! I fly from Pebble Creek to Glacier Vista. Defeat! "The 1934 race was really crazy, but several years later with starts 1 minute apart it was better. �Also by 1936 when I raced the equipment was far better. �Later Hannes Schroll, the Austrian downhiller, made a super fast run and beat the rest of us by one full minute. � I don't remember which year that was; �others made it in 5 minutes or 6 minutes. �It all ended when Sig Hall killed himself in a fog hitting McClure rocks at high speed -- that finished the Silver Skis with a tragedy." Larry, it's great to see skiers like your dad keeping tabs on us whipper-snappers. Many people (even old-timers) believe that Sig Hall's death ended the Silver Skis. It didn't. There was an investigation, but no major changes came of it. Hall died in 1940, but the race went on in 1941, 1942, 1947, and 1948. 1942 was the year during which the 87th Mountain Infantry soldiers, with skiers like Walter Prager, entered the race. They were beaten by Matt Broze, a Seattle fireman. Here is a link to results from every year the race was run. It would be great find other veterans of the original Silver Skis races with web access to get their recollections. I know there are a few out there. John Woodward is one. BTW, here's a link to Zeno's thread with his nice picture of the starting line-up. Nicely done Jason. We will now expect all future trip reports in verse. Congratulations, you men of men. I'm sorry I couldn't make it up there to add a woman to the race. Kam shared the details and made me rightly jealous of the blue bird, the snow, and the grand hurrah. Lowell, hats off to your organization and well written tale. I hope there will be more opportunities for history revisited. "she'spiste she didn't make the Geschmozzel"
Dang, I got pulled out of lurk-dom in order to be able to post to this thread. �For an internet discussion group inspired event, this one must take the cake. �Lots of great enthusiastic folks showed up. I tried piecing together some of the video clips from the finish area. �After shrinking the file size to make it more manageable for us poor dial-up users, the movie image is kinda small, but the audio gives those who weren't there a taste of what it was like from the participant's own mouth. I also had attempted to capture some points off of the GPS by having it running in my pack, but managed to only capture a maximum speed of 56mph sometime before it was inadvertantly turned off, presumably after hitting that kicker. I especially enjoyed Jason's prose. Well put! But luckily there were enough guys up there and we all started talking a little bit of smack; I soon lost the desire to turn. I for one had my old Demetre ski sweater, circa 1986, but alas I don't think anyone was intimidated. Once the countdown went we all started in our tucks. I didn't think that I was going to go straight down the whole snowfield, but it turned out it would have been scarier to turn at those high speeds. As I schussed down I remembered my old ski racing days, especially a day at Wildcat, New Hampshire, when I was racing in a Super G., had my head down in a tuck, and hooked a gate... now that was an explosion. And not a particularily good flashback to have at that moment! One of my favorite memories was skiing down past Pebble Creek, then past the line throught the rocks that I had scouted out. As I hiked back to where I needed to be I was totally out of breath, totally exasperated, and there was a lone tele girl sitting there on the rocks eating a snack. At this point I was a little ahead, so it must have looked like I was just some crazed lunatic. I muttered that I was in a race, and that I had to go, but for her to have a nice day. As I scurried through the rocks I was wondering what this girl must have been thinking! A race? By himself? In the backcountry? But as I almost started laughing, Jason showed up, and I re-focused. I skated away only to hear Jason yell... "my binding!". And I was off. It was really great to meet a bunch of you guys from the ski mountaineering community here. I am from New Hampshire, here for graduate school, so I don't have a huge network of ski buddies. It was great to meet the people behind all these websites I have scoured to see where people go in the Cascades! For the longest time I have considered tele-skiing as the least competitive thing I did. It is something I love to share with people and something I do for myself. But I have always wondered what it would be like to do something like the Silver Skis. In N.H. they ran the Inferno down Tuckerman's Ravine on Mount Washington, and I grew up hearing stories about it. This year I also competed in the tele comp. at Crested Butte, which was also fun, but I will have to vote that the "Silver Skis" was a better time! So now we'll all just have to figure out how to beat the old timers' times! a fantastic day overall. i enjoyed seeing/meeting everyone at Camp Muir. Adam (i think it was you), thanks for offering the bailing wire to save me the trouble of walking, instead of skiing, down! though this contraption functioned, i'm more partial to the real deal. i found the race a thrill. i remember most the first 30-seconds of the excitement and release of energy when we were free to descend. this was the most thrilling part of the race. after Lowell fired his imaginary pistol, i saw to my left a small group that immediately straight-ran the Muir Snowfield. i kept an eye on them for about 3-seconds, and then i prioritized my focus on others that were closer. i remember seeing a couple racers carving in and out of my peripheral vision, invading my personal space. for me, the initial 30-seconds was the most thrilling because of the information that had to be processed, like: avoiding a crash with other racers, avoiding a crash with hikers/skiers ascending, anticipating the terrain ahead, maintaining control, picking the best line, and of course, tolerating the muscle spasms in my legs. but as the minutes passed, i eventually found myself alone. it seemed that everyone had spread out. from Pebble Creek to Paradise i remember feeling the mind-numbing muscle pain in my legs. my pace dropped significantly at this point. but suprisingly, the bailing-wire binding held together as i skied to the parking lot. having gone through this experience, hats off to those who raced in the past on less advanced gear and in worse snow conditions. it's amazing what they accomplished back then! for those interested, i've posted a few photos here. Great video! Definitely a keeper. Call it "Ten Dirty Dollars." Boy does that bring back some grins. Thanks for posting it small enough for us dial-up Luddites. Back East the Geschmozzel was known by the less-PC name "Chinese Downhill", a term coined, I believe, in the late 70's classic Hot Dog the Movie. Nice to see the tradition kept alive, here and elsewhere. Brings me back to grade school ski clubs nights at mighty Mount Southington. Also of note, the Mt Washington Inferno has been resurrected in recent years as well, although it's now a pentathlon whereas the original was just a crazy DH (I'm not sure, but they may have used mass starts as well at some point). Anyone who has ever skied Tuckerman has heard the story of Toni Matt's Headwall schuss. Thanks for the article Jerm. I found this quote somewhat entertaining, ""This here was probably the most gnarly Chinese Downhill run in the world...."
The casual friendly atmosphere up at Camp Muir makes for a pretty relaxed lead up to the race, but as Lowell announces "15 seconds! ", and begins the countdown from 10, adrenaline surges into my body. The race starts, I see most of the skiers head off pretty quickly, and am occasionally dismayed to see them as smaller and smaller dots as I crest each roll. I want to straightline, but my board just seems to skittish to not have on edge at all times. I wonder whether I might be way behind everyone else in last place, but eventually, I start seeing folks off to my right, and start gaining ground. I am excited to be passing people! In my peripheral vision, I see a figure to my right occasionally veer close to me. Once. Twice. Suddenly Dave is right in front of me! Yikes! Close call, missed him by a foot or two. Minutes go by. I crest the steeper pitch two thirds of the way down the snowfield, and am frustrated by my unwillingness to straightline. Eventually I cross the boot path, and zip by a few by-standers, trying to ensure I have a downhill-only line as I approach Pebble Creek. Finally, here it is, the first windlip. And the second. Fun... finally down my chosen line to the rocks in Pebble Creek. Passing only a foot or two from some large jagged rocks, I almost wipe out at "full" speed - yikes! As I take my board off to run across the rocks, the realization of how tired my back leg is sets in... it's quivering, spasms... am I going to be able to continue? I gain some elevation so I can glide through the next section. It works, with a little bit of poling. Now I'm heading towards panorama point, and my mind is on overdrive, trying to process all the rock piles, and the lines I had scoped out on the way up. This section is key. Wait... have I gone too far down? Turn right at the blue wand - that's what I recall when Jason and I hiked through here this morning... oops, there goes the blue wand - but wait, the blue wand was the lowest one, and there are more below. Hmm, but they aren't blue. I'd better turn right here! My board goes off, and I start walking on rocks again - no! this is the wrong place! I look down at 100 vertical feet of talus. Do I go for it? No, I decide to head back to the bootpath and put my board on a again. As I do, I see two skiers race by. Doh! I just dropped two places! I'm on my board for only another 50 yards or so, before I realize where I am, and where I need to be. Oops. I mutter under my breathe "well, that right there just lost me the race!". Then I chuckle to myself "like I ever had a chance!". I continue muttering comments into the helmet cam's mic, unaware that it had ceased to work back in Pebble Creek. Back on track, I glide down my "secret" all-downhill path around pan point. A jolt takes me across the hiker's boot path again, and then I glide effortlessly onto... a sticky low-angle depression, with no tracks in it to offer speed. Now I wish I had gone down Pan Face! It is a slow glide back to the main track. And now I'm confused about where the continuous snow is again - I keep high just in case, and now in front of me I see a skier start to back track uphill and ski around a patch of heather - doh! Soon I'm looking at a melted out staircase and a trailsign. Not wishing to waste any more time, I glide my board over a small patch of meadow, expecting to be subject to the scorn of a ranger. I don't want to hurt the plants, but there are bigger things at stake here! Now I'm on the fast track down to altavista, and the corrugated snow is difficult on my board. Absolutely exhausted, I stop for about 5 seconds above a short pitch - the only time I rested the whole way down. A little poling gets me through an uphill section, where I hear Kurt coming up from behind me. For some reason I thought he was the one that headed down 5 minutes before every one to take pictures, and so I didn't realize that he was actually a very real threat to my finishing position! Someone announces my time as a slide into the parking lot. 20 minutes! Like others I talked to, I had the impression that I had gone a lot faster than that. Also of note, the Mt Washington Inferno has been resurrected �in recent years as well, although it's now a pentathlon whereas the original was just a crazy DH (I'm not sure, but they may have used mass starts as well at some point). Anyone who has ever skied Tuckerman has heard the story of Toni Matt's Headwall schuss. Absolutely. The Inferno in Tuckerman Ravine is an American classic. Toni Matt's 1939 schuss of the headwall (made by accident when he mis-read the terrain) is legendary. Incidently, Toni Matt placed second in the 1940 Silver Skis race, the one in which Sigurd Hall was killed. Matt ran before Hall, and also went off course, but was able to recover. I believe that Toni Matt is still around, in his 80s. Anybody know for sure? I don't think I've ever read anything that says the Inferno used a mass start. They ran it three times in the old days: 1933, 1934 and 1939. There was a good article about the race in the Summer 1998 newsletter of the New England Ski Museum. Because Mt Rainier is a national park, I think it's unlikely the Silver Skis race would ever be revived officially, even if we wanted to. As for myself, I think last Sunday's re-enactment was perfect--low key, no sponsors, no prizes, not too competitive, don't ask, don't tell. If we do anything like this again in the future, I'd recommend keeping it that way. If something like this just somehow happens again, and if there is a geriatric division, I'd give it a try. Provided that is if I think I could get up there with my old Rossi SM's and orange Lange boots. Now that would be fun!